The Winnie the Pooh movie is preceded by a short animated film about Nessie. It’s a cute story about the Loch Ness Monster and her best friend MacQuack, who is a rubber duck. Their home in a pond is overtaken by a golf course and so they set out to find a new home. I always enjoy it when they have the short films before the movie. They are a fun addition. 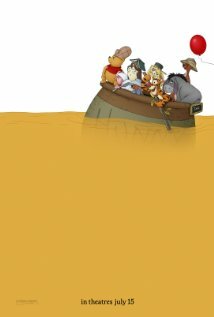 Winnie the Pooh has more then one story line within the film. Pooh has run out of honey and is in search of some breakfast when he discovers Eeyore has lost his tail. They gather all their friends in the Hundred Acre Woods to help find a replacement tail and whoever succeeds wins a Honey pot. Another story line involves misinterpreting a note from Christopher Robin where they think he is kidnapped by a mysterious creature called the Backson (back soon). The story is narrated like the original Pooh stories and is everything you would expect from a Winnie the Pooh movie so you won’t leave disappointed. Most of the humor involves misinterpretations and is funny for the adult and child. It’s a great film for the whole family. It would make a great first movie for a child that has never been to the theater for it captures even the youngest audience. The story is fun and includes several cute songs that will keep younger children’s interest. Winnie the Pooh is now playing at Dinuba Platinum Theatres 6. Showtimes can be found on their website.